Hi my name is Sue and I love the ocean, I love my dogs, I love to exercise and I found a way to enjoy all my passions at one time. Stand up Paddle Boarding!!! Paddle Board The Keys represents my passion to connect people with nature while offering a fun way to stay fit. I quit my job and moved to The Keys just over 7 years ago and I never looked back. It surely wasn't the T shirt shops on Duval or the dangerous drivers on US 1 that lured me here. It was my love of the salt air, the ocean and the amazing, and I am afraid quickly disappearing beings, that inhabit it. I wanted to be able to see them every day to appreciate their uniqueness and their contribution to our existence. Ok so no more board rooms and shoes that hurt my feet didn't hurt either. 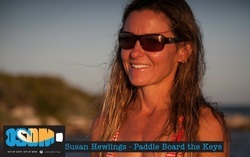 SO if you have never tried Stand Up Paddle Boarding, give me a call and I will show you why I love it so much! !